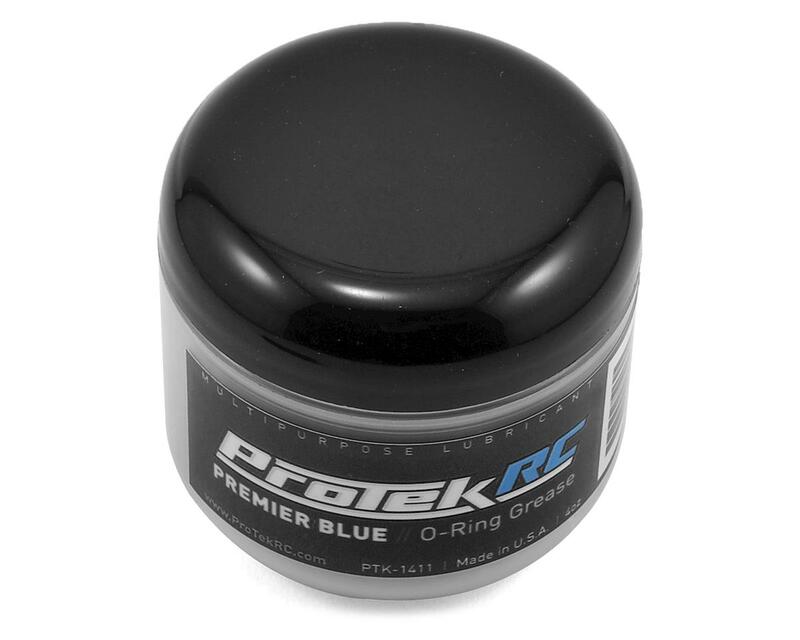 This 4 fluid ounce container of ProTek R/C "Premier Blue" O-Ring Grease and Multipurpose Lubricant is a deluxe o-ring grease that provides exceptional sealing, lubrication and stiction-free performance for suspension parts, bearings, bushings, pivots, as well as any other linear movement applications. It features a specially-formulated mixture of additives that won't cause seals or o-rings to swell or deform, and it features unparalleled sticking power to last for prolonged performance. For R/C model applications, apply Premier Blue on the o-rings during installation and a little dab on the shock shaft threads before installing through the o-rings. Premier Blue will protect the o-rings from deformation, swelling, tearing and stiction, while maintaining lubrication and protection from leaks. Premier Blue will also coat the shock shaft for long-lasting buttery smooth performance. "The new ProTek R/C Premium O-ring grease works great for shock o-rings. The unique formula stays on the o-rings and protects them from the silicone oil which allows the o-rings to last longer and prevents friction." Premier Blue also excels with bicycle and motorcycle suspension. With an application on the shock or fork seals, the stanchions will remain buttery smooth while the seals will stay lubricated and leak free. Premier Blue also works great to lubricate dropper post seals, as well as any other pivot areas that need a little love. Premier Blue excels when it comes to suspension seals, o-rings and shock shafts. 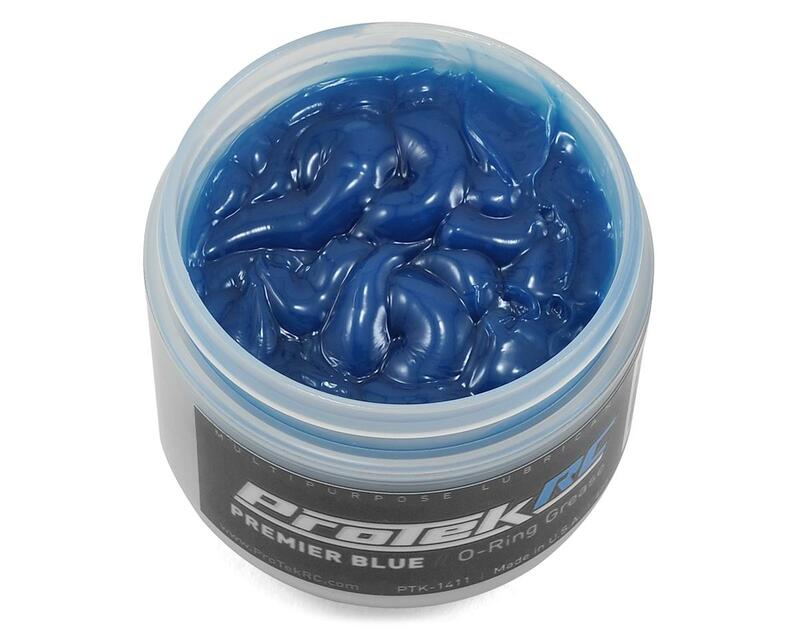 From R/C model shocks, to bicycle suspension, to motocross, Premier Blue is the go to grease for all your high performance suspension needs. Using a specially-formulated mixture of additives, Premier Blue won't deform seals or o-rings so they always retain their shape and size. Premier Blue also impregnates the pores of the surface for a deep lasting coat of smooth lubrication. Premier Blue special formulation provides a layer of protection that is excellent at resisting corrosion and oxidation. Additionally, Premier Blue also provides a waterproof layer for long-lasting smooth performance when things get wet. Water Washout, D-1264 Modified, 175 F, % loss: 5 Max. Great stuff! Super slick. I've used it on my shock O-rings and this stuff works wonders on sticky tie-rod ends. I put a bit on the threads and a little bit inside the ball cup.